Those users that have a Google+ account have noticed the big changes that Google has put in place with regards to their new “Search, Plus Your World” feature. Google has become the first company to successfully integrate search results and social media and I must say I do like the personalization of my search results with elements of my social circles. As you can see above Google has given me a taste of my Google+ circles. They now know that I am interested in information from key SEO specialists around the world and shown me their latest posts. They know that I am often in heated debate with +Rafiq Phillips and may want to recap on information we discussed with regards to the search query. How does this change the SEO Game? Well, if you are not on Google+ then it is time to get active. The more friends you have that share your interests the better your search experience will be. As for business you can be sure that like minded industry professionals will be seeing your content and vice versa so there is no reason not to be part of your competitors circles as they may give you some insight into the industry you are in. As more and more people use SPYW the insertion of personal results will start to benefit your company if you are part of your target audience circles. Spammers will most likely be using this new feature to bombard us with their junk, however, it is your choice who you add to your circles and most of the Search, Plus Your World (SPYW) features will only show information from people in your circles. 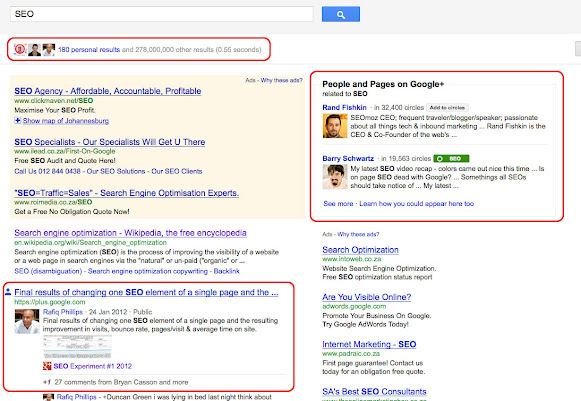 Google still gives you full control of what/who you want in your SERPs. Google gives you the option to turn on and off your personal search results by clicking on the little world icon. I always recommend signing out completely if you want no personal results at all. Give it a bash, if Google does make your search experience better, then keep it. If you are not a fan then simply turn off the feature. Let me know what you think. I have seen the SPYW results in South African search results so there is no doubt that they will be rolling it out to SA users as soon as this week.